Population genomics and quantitative genetics. Many aspects of biology rely on our understanding genetics – from the origin of species to the causes of disease. My recent work uses next generation sequencing and high throughput phenotyping to explore this in the fission yeast Schizosaccharomyces pombe. I sequenced all the wild strains of S. pombe that had ever been collected, and conducted the first 200 genome-wide association studies (GWAS) for this species (download the paper). Eukaryotes with small genomes such as Plasmodium and the fission yeast S. pombe contain most of the elements of large eukaryotes genomes (such as human), in a small package. With Manolis Dermitzakis, Matt Berriman, Tobias Mourier, Jürg Bähler and many others, I have looked into the functional constrains and diversity in these genomes. This topic continues with my analysis of diversity and quantitative traits in S. pombe (see here). Conserved regions (yellow), exons (grey) and GERP score (black peaks) in Plasmodium genomes. 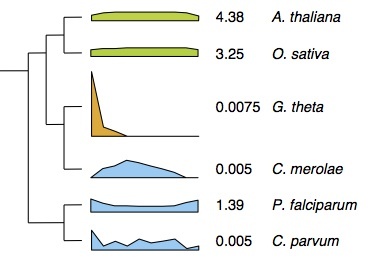 In these genomes most (but not all) conserved elements are exons. The same conclusion was reached by analysing diversity in S. pombe strains. Intron gain and loss, and what drives it. With David Penny, Tobias Mourier and Jürg Bähler I became interested in patterns of intron gain and loss in eukaryote genomes over evolutionary time. Tobias and I showed the first smoking gun that reverse transcription-mediated loss was common, and the rates of loss were dependant on factors of both the organism (mainly population size), and the gene. With Jürg and Chris Penkett I showed that rapidly regulated genes tended to lose introns (or not gain them). Intron loss in the highly reduced ‘nucleomorph’ genome of the Guillardia theta (G. theta). On the phylogeny of related species we show the intron density (introns/gene) and the distributions of introns relative to 5′ or 3′. G. theta has both low intron density and an extreme 5′ intron position bias, consistent with intron loss by reverse transcription. The early evolution of life. This research began in my honours year. With Anthony Poole and David Penny, we attempted to infer the final complexity of the RNA world, based on the ‘molecular fossils’ that remained in living cells. We would then infer some properties of the last universal common ancestor (LUCA). The evolutionary history of all life in one diagram. After the origin of life we are pretty certain that there was an ‘RNA World’, where both genetic material and catalysts were made of RNA. 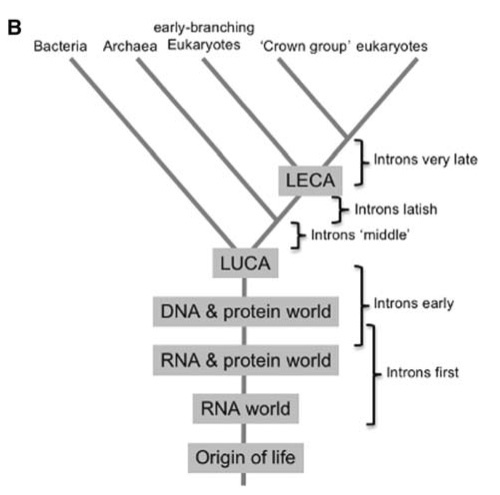 All living things on earth evolved from this RNA world via the Last Universal Common Ancestor (LUCA). Mei2-like genes in plants. During my PhD work with Bruce Veit I learnt all the standard molecular biology, studying plant development, and begun genome-scale analysis of the mei2-like gene family in the Arabidopsis genome.